The first impression of an 'insurance sales agent' brings up dreadful memories of non-stop pestering, red tape and frustrations. AI empowered insurance agents, on the other hand, are bringing about an image makeover. They are discreet enough not to interrupt a prospective buyers' exploration journey but prominent enough to help out when needed. Artificial Intelligence (AI) is already transforming the routine of an insurance agent and drastically changing the way they work. From guided selling, proactive services, automated marketing, forecasting etc, more insurance users are using AI to be more productive and provide smarter, delightful customer service. The following are the prevalent AI use cases for an insurance agent. AI is aiding insurance agents to know the right 'time' to send campaign mails based on a customer's previous open mail activity. For example, Mr. X will receive the campaign mail in the morning when he usually checks his emails, Mr.Y on the other hand will receive the same mail in the evening according to Y's mailing activity. Such modifications drastically increase open rates and conversions. Intelligent algorithms trained in big data create personal policy recommendations based on a customer's past behavior, activity, and purchase history. It empowers the insurance user with granular insights for targeted segmentation. For instance, machine learning is educating agents with the best age group to target for maximum premium with minimal risk through RFM (Recency, Frequency and Monetary) segmentation. AI is enabling insurance agents to become more agile, efficient and competitive. Instead of the traditional method of lead scoring, mathematical models predict and prescribe the best characteristics of a great prospect fit. By channeling the power of predictive analytics and big data, users can rank prospects based on conversion probability and more importantly, determine intent to buy. It helps to align target sales messaging to the right prospects. After taking care of prospects, AI helps insurers to keep ahead of market opportunities, trends. Its also aids in identifying upselling and cross-selling opportunities and also the best possible action to convert into a lead. With the help of deep machine learning capability, you get insight on whether the opportunity is actually worth pursuing. It points out the hidden opportunities and retrains the sales pipelines to be more relevant and personalized to individual prospects. AI turns the art of sales forecasting into a science. With the help of big data insights powered by data science, it brings discipline and accuracy that meaningfully affects insurance business growth. However, it is important to note that forecasting algorithms need a strong rationale behind the models. Strong rationale backed by volume of relevant historical data helps to identify deviations so that the learning can be implemented in the next sales cycle. Insurance agents double as relationship managers (RMs) for their clients. With the help of machine learning, service cases are automatically escalated and classified as they come in. In addition, relevant information required to resolve cases, such as knowledge articles or videos, are automatically surfaced, saving agents valuable time and creating improved customer experiences. It can even foresee customer satisfaction and make specific recommendations to improve the customer experience. AI empowers agents to become a troubleshooter and immediately solve problems before it manifests into a catastrophe. Jason wanted to buy a medical insurance from a top insurance company. John, an insurance agent used AI inside CRM to combine the data from Jason's demographics, public social media information, location weather, telematics and wearable data to conjure up a complete user profile that spoke about Jason's probable health risks. This empowered John to offer a discounted premium plan and delight Jason. Some insurers love tradition. They make humans slog to push generic policies. Others are inspired by trends and make use of AI, machine learning to sell new products. Visionary insurers, though, take the best of artificial and human intelligence, add a hefty dose of machine learning and empower their customers to buy relevant and customized policies. 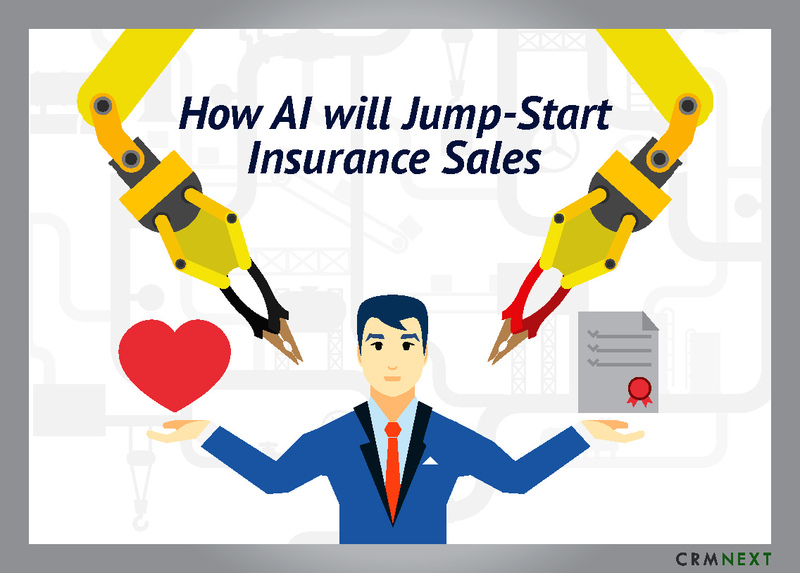 AI in insurance empowers insurers to deploy personalized sales tactics. It can analyse big data and create a holistic customer profile that can be used to sell tailored policies and remember customer preferences. But that's not all. AI brings in many advantages to insurers. Insurers need not deploy teams of surveyors to assess risks and audit applications. Availability of abundant data through social channels, medical records, apps, IoT devices makes it easy for insurance CRM platforms to apply machine learning to get the desired results without additional and expensive manpower. AI-powered chatbots can pre-screen inquiries and complete end to end buying journeys online without human intervention. This translates to lower premium for buyers and increases coverage. Insurers can discover new emerging technology, lifestyle and business trends and accordingly bring out new products. For instance, the emergence and prevalence of autonomous Tesla cars have encouraged a leading insurance start-up to offer premiums based on driving habits. Evidence suggests that the driving safety is directly proportional to the amount of time the car is driven in autonomous mode. So, users who drive car autonomously are offered lesser premiums than those who drive manually. This discovery and integration into insurance processes are made possible due to the multitude of information crunched by superior computing power. These models assist in setting insurance premiums. Digital insurance CRM, taking advantage of the breakthroughs in computing power, do most of the legwork. Business processes are made faster with the help of robotic process automation. Visual designers enable agents to create customer journeys that captivate customers as they glide between channels and products, just by dragging and dropping pre-defined objects. Insurance CRM integrates seamlessly with multiple data platforms including social media, to get up close and real-time customer intelligence. Bringing in AI and digital tools will not displace insurance agents and their selling prowess. Instead, it will act as a relationship innovator that changes the dynamics between technology, insurers and the insured. Grow Assets and Profits by over 25% with the World's Most Powerful Banking CRM!